To make watermelon ice cream I have used an ice cream maker. Ice cream maker has a lid to which machine is attached. It has a paddle attachment which rotates while running. The lid with machine is fixed on a double layered bowl. Take a mixing bowl and add milk powder and milk and mix well. Use a whisk to mix milk and milk powder mixture to avoid lumps. Add the smoothened milk powder and milk mixture to a blender. Add watermelon marmalade and blend well. Then add cream and whip to mix well. Add watermelon syrup and blend again and observe that it gets a nice color. Taste the mixture and add powdered sugar accordingly and whip to mix well. Take a wide bottomed steel box and transfer the ice cream mixture into it. Check for sweetness and add sufficient powdered sugar if required and mix. Cover the steel box with a tight lid and place this box in freezer to chill the ice cream mixture. 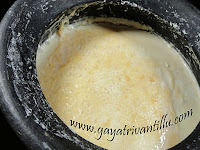 Adding chilled mixture in the ice cream machine sets the ice cream fast. Take a measuring jug which has pointed mouth as it helps in pouring the mixture into the ice cream machine easily. Once the ice cream mixture is thoroughly chilled remove the bowl from freezer. Using a whisk stir the ice cream mixture to avoid any lumpy frozen ice cream mixture at the bottom of the box. Now transfer the chilled ice cream mixture into the measuring jug. Ice cream mixture is ready to make ice cream. Generally when chilled mixture is used ice cream sets fast say in 10 to 15 minutes. However if the weather outside is too hot then it may not set easily. Switch off the machine, when the mixture thickens. To further thicken the ice cream transfer the mixture from ice cream machine into plastic boxes and freeze. Carefully remove the paddle. Take a plastic box and transfer the prepared ice cream into the box using a ladle. Fill the box sufficiently with ice cream and cover it with a tight lid. Place the box in freezer and see that the box touches the bottom of the freezer to set fast. Transfer remaining ice cream also into boxes and freeze for 4 hours. After 4 hours remove the box from freezer and keep it at room temperature to soften a bit. Take a scoop and scoop out ice cream and place in ice cream cup. Fill the cup sufficiently with ice cream and serve immediately. If required adding powdered sugar mixes well without overbeating the cream which may turn into butter!!! Add powdered sugar according to taste. After blending the mixture taste it and adjust the sugar. When ice cream is frozen it would be difficult to serve isn’t it? To ease this problem here is a tip. Place the ice cream box in microwave oven and heat on high power for 20 to 25 seconds to defrost depending on how hard the ice cream is. Observe that the ice cream softens in seconds to scoop out comfortably---but remember not to heat for long period otherwise it would melt.While making ice cream I have not set the refrigerator to the coolest temperature. I have set the fridge at normal level where we use it for daily needs. As I have used the ice cream maker it freezes and almost sets the ice cream---so it was not required to have fridge at the coolest temperature. So it took 4 hours to firmly set the ice cream after placing the plastic box in freezer. If the fridge is set at the coolest point, it may take further less time to set. Using aluminum containers or foil packs to chill or set the mixture, it freezes fast (within an hour). 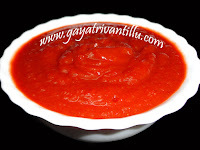 Watermelon marmalade is made with the pulp of watermelon and hence gives body to the ice cream. Watermelon syrup gives a nice color and aroma of watermelon in this ice cream. Serve the super soft pink colored watermelon ice cream garnished with a drizzle of watermelon syrup.